Liverpool Hospital is implementing a home-based subcutaneous immunoglobulin (SCIG) replacement therapy program for patients with impaired immune systems. To implement a home-based SCIG program for all suitable haematology patients who need immunoglobulin replacement therapy. SCIG is at least equivalent in efficacy as intravenous immunoglobulin (IVIG) replacement therapy. SCIG is associated with fewer side effects, compared to IVIG. SCIG can improve patient satisfaction and quality of life. A home-based SCIG program will free up a significant proportion of outpatient spaces and resources for other needed therapies. Immunoglobulin replacement therapy can be life-saving in patients with impaired immune systems. When delivered intravenously, the patient needs to spend six hours in the outpatient clinic every month. At Liverpool Hospital, outpatient booking spaces are in demand and there is always a backlog of patients requiring priority treatment. An alternative to IVIG replacement therapy is a subcutaneous approach, where patients inject themselves with the treatment just under the skin on a weekly basis. This can be done in the comfort of their own home at a time that suits them. Home-based SCIG replacement therapy has shown to be as effective as the intravenous approach, if not more, and associated with fewer side effects. SCIG replacement therapy has also shown to improve patient satisfaction and quality of life. Implementation of a home-based SCIG program will free up a significant proportion of outpatient bookings spaces and resources that can be directed to other needed therapies. A hospital-wide policy was developed for SCIG replacement therapy at Liverpool Hospital. A business case proposal for funding the initial set-up costs and annual maintenance for 30 haematology patients was endorsed and approved by the executive committee. The development of an implementation pathway and training of delegated nursing staff and patients is currently underway. 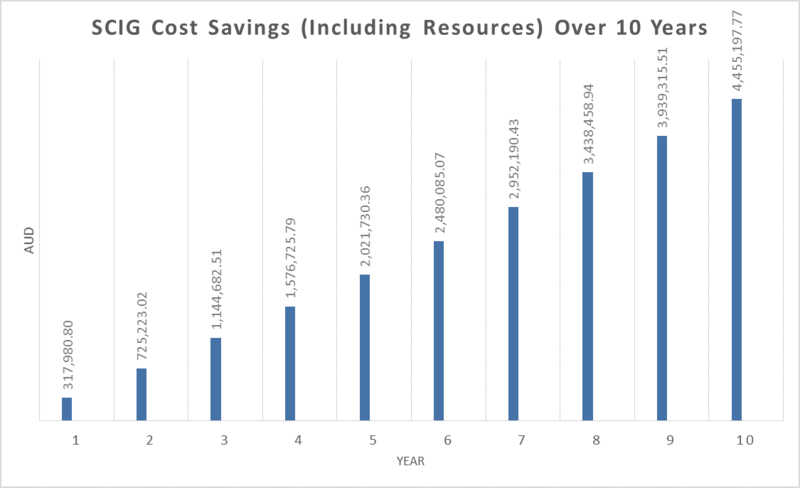 projected savings from redirecting suitable patients to a home-based SCIG program. The projected savings after 10 years of transitioning 30 patients from intravenous to subcutaneous route of immunoglobulin replacement therapy amounts to a total of $1,236,140.40 (not including costs associated with dedicated nursing staff and outpatient booking hours). The total projected savings amounts to $4,455,197.77 (including nursing staff and outpatient booking hours). outpatient booking hours - $100 per hour. Year one takes into account initial set-up costs. The number of outpatient hours saved amounts to 21,600 hours that can be used for other needed treatments, such as chemotherapy and transfusion support. Funding for healthcare initiatives is difficult, due to competing demands of other departments. Convincing financial modelling as well as early engagement with stakeholders and executive committee members can be helpful. Asia Pacific Immunoglobulins in Immunology Expert Group (APIIEG). Consensus Recommendations for the use of Immunoglobulin Replacement Therapy in Immune Deficiency. 2nd Edition. Parkville VIC: APIIEG; 2009. Australasian Society of Clinical Immunology and Allergy (ASCIA). Position Statement Subcutaneous Immunoglobulin (SCIg). Brookvale NSW: ASCIA; 2015. Berger M. Subcutaneous immunoglobulin replacement in primary immunodeficiencies. Clinical Immunology 2004;112(1):1-7. Bonilla FA. Pharmacokinetics of immunoglobulin administered via intravenous or subcutaneous routes. Immunology and Allergy Clinics of North America 2008;28(4):803-19. Chapel HM, Spickett GP, Ericson D et al. The comparison of the efficacy and safety of intravenous versus subcutaneous immunoglobulin replacement therapy. Clinical Immunology 2000;20(2):94-100. Commonwealth of Australia. Access to Subcutaneous Immunoglobulin (SCIg). Canberra ACT: National Blood Authority; 2017. Gardulf A, Nicolay U, Asensio O et al. Rapid subcutaneous IgG replacement therapy is effective and safe in children and adults with primary immunodeficiencies – a prospective, multi-national study. Clinical Immunology 2006;26(2):177-85. Gardulf A, Nicolay U, Math D et al. Children and adults with primary antibody deficiencies gain quality of life by subcutaneous IgG self-infusions at home. Allergy and Clinical Immunology 2004;114(4):936-42. Haddad E, Barnes D, Kafal A. Home therapy with subcutaneous immunoglobulins for patients with primary immunodeficiency diseases. Transfusion and Apheresis Science 2012;46(3):315-21. Hoffman F, Grimbacher B, Thiel J et al. Home-based subcutaneous immunoglobulin G replacement therapy under real-life conditions in children and adults with antibody deficiency. European Journal of Medical Research 2010;15(6):238-45. Jolles S, Sleasman JW. Subcutaneous immunoglobulin replacement therapy with Hizentra, the first 20% SCIG preparation: a practical approach. Advances in Therapy 2011;28(7):521-33. Kobrynski L. Subcutaneous immunoglobulin therapy: a new option for patients with primary immunodeficiency diseases. Biologics 2012;6:277-87. Misbah SA. Effective dosing strategies for therapeutic immunoglobulin: managing wear-off effects in antibody replacement to immunomodulation. Clinical and Experimental Immunology 2014;178(Suppl 1):70-1. Nicolay U, Kiessling P, Berger M et al. Health-related quality of life and treatment satisfaction in North American patients with primary immunodeficiency diseases receiving subcutaneous IgG self-infusions at home. Clinical Immunology 2006;26(1):65-72. Ochs HD, Gupta S, Kiessling P et al. Safety and efficacy of self-administered subcutaneous immunoglobulin in patients with primary immunodeficiency diseases. Clinical Immunology 2006;26(3):265-73. Stein MR, Nelson RP, Church JA et al. Safety and efficacy of Privigen, a novel 10% liquid immunoglobulin preparation for intravenous use, in patients with primary immunodeficiencies. Clinical Immunology 2009;29(1):137-44. Wasserman RL, Melamed I, Nelson RP Jr et al. Pharmacokinetics of subcutaneous IgPro20 in patients with primary immunodeficiency. Clinical Pharmacokinetics 2011;50(6):405-14.